C&G Partners’ Maya Kopytman participated in the 20th annual Museums and the Web conference last week in Los Angeles. In line with the conference’s mission of showcasing exemplary digital practice for cultural and scientific heritage, our client, Chris Gauthier, demonstrated the interactive storytelling map designed by C&G Partners for The Smithsonian’s Lemelson Center for the Study of Invention and Innovation. The project was created for the center’s multifaceted research project and exhibition, Places of Invention. 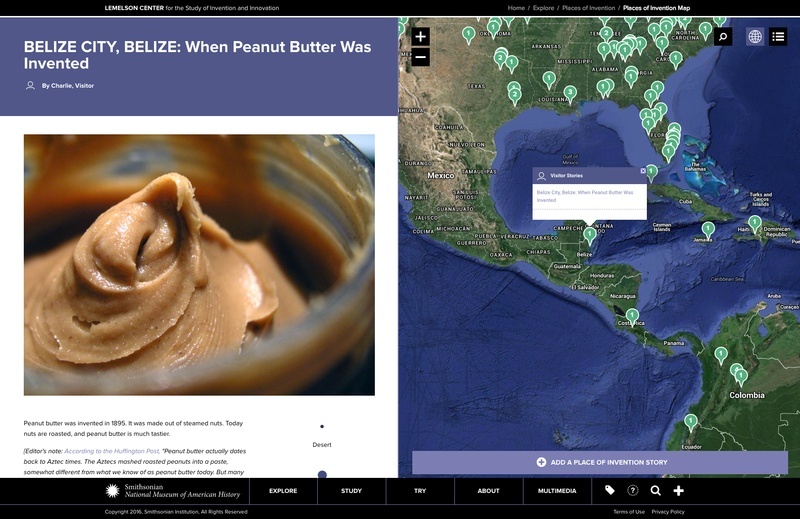 The interactive map highlights collaboration as a central tenet of invention. It asks visitors to submit stories of invention from their hometowns, either online or in the gallery, and allows them to explore narratives by other participants. It provides a responsive, mobile-optimized online space to nurture a curious and engaged community. Since opening, the interactive map has had tens of thousands of views and over 5,200 contributions, and according to Lemelson Center studies “evaluations indicate that visitors love the idea of collaborating to tell stories of invention”. The Web Marketing Association also awarded a 2015 WebAward to C&G Partners’ overall design for entire the Lemelson Center for the Study of Invention and Innovation website.